The Christmas beer was in the fermenter for two weeks, so it was bottling time. Fermentation started quickly, lots of bubbles in the airlock for about 4 days, after which, things trailed off quickly. The biggest question with this brew was the spices and damn, this smelled great. The cloves were probably the most prominent of the spices, but it seemed well matched to the rest of the beer. That being said, I wanted to get some more cinnamon out of this, so I chucked a few cinnamon sticks in the bottling bucket to give it some extra... cinnamonity? And the finished product did indeed seem to display a little more cinnamonitivity. My guess is that the spiciness will fade in time, so this will probably be nice and complex by Christmas. Final gravity was 1.014, which was a hair lower than expected, but that's a pleasant surprise. If my calculations are correct, this will bring the beer to around 6% ABV, which was my exact target. I gave it a taste, and it seems pretty good. I don't really have a feel for how non-carbonated beer will taste once it's carbonated, but this seems right. Nice spiciness, good body, seems like it will be good stuff. The appearance is a very pretty dark amber color. There's about 6 weeks before Christmas, which should give it enough time to condition in the bottle. My saison was awesome at week one, but that's rare and in this case, I'm assuming the spices need some time to settle down. 6 weeks should do the trick. I recently lamented my lack of double feature posts, a fault more of circumstance than anything else. I've been drinking more of a variety (which does not always lend itself to the comparative nature of double features), and some styles just don't lend themselves to this type of post. One style that's always been a boon to double features is the IPA. It's a style of tremendous variety, yet you can often come away from drinking one particular example feeling that it tasted kinda the same as any other IPA. So pitting two examples of the style against one another and comparing the differences has always been illuminating. This double feature was a bit odd, for a few reasons. 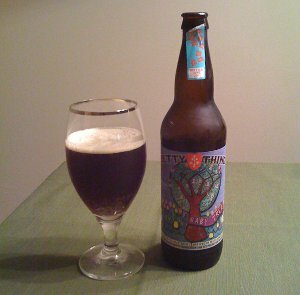 By total coincidence, they were both 7.2% ABV, lending a nice sense of stability to the proceedings. 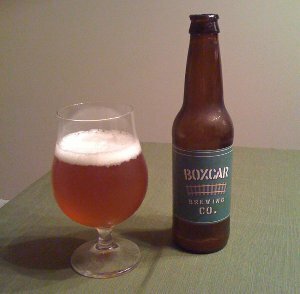 But then, one of the beers tasted nothing like an IPA, despite being labeled as such. 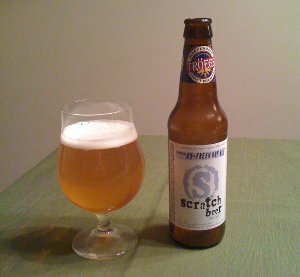 Tröegs Scratch Beer 49 (Fresh Hop IPA) - This is from Tröegs's experimental series of small batches where they are able to play with strange ingredients or non-traditional brewing techniques. In this particular case, we've got a Fresh Hop IPA. Also known as a Wet Hop beer, this is basically a style that utilizes hops that were picked within 24 hours of brewing the beer. Most hops are dried, concentrating and preserving the various flavors and aromas. They're often processed even further into pellets or plugs, which generally helps preserve their potency. But a lot of breweries will ask their local hop providers for some fresh hops so that they can brew something with them, and thus we get fresh hop beers. They're also called wet hop beers because their water content is 80-90% of their total weight (these will go bad if you don't dry them out or use them right away). I've actually had a few fresh hop beers this year, and there is something different about them, though I'm not entirely sure I could pick them out of a lineup. Beer Nerd Details: 7.2% ABV bottled (12 oz). Drank out of a tulip glass on 11/4/11. The Boxcar beer kinda threw me for a loop. I feel like the lone review on Beer Advocate is pretty unfair, as it's a D+. When you read the review, it seems he's docking points because it's not really an IPA. It's a fair criticism, but then the rating says under it "Avoid", which is pretty unfair, as it's a pretty good beer. I agree that it's not really an IPA, but I don't really know how that should play into its rating. It seems more like a criticism of the branding or marketing of the beer than the beer itself. But on the other hand, it's branded/marketed wrong! Weird. I suppose I should also disclose that this is an uber-local brewery (right down the street from me, basically in the dude's garage), and I'm a total homer, so I'm inclined to cut them some slack. But I suppose if you're really looking forward to an IPA and you open this, you'd be in for a big surprise. What say you? [Koningshoeven] made Dubbel and Tripel for a long time and has "reinvented" (Tim Webb) the terms Enkel and Quadrupel to extend its beer range at either end of the strength scale. The terms double and single for different strengths of beer were used across Northern Europe: the three commonest styles of Swedish beer before the middle of the 19th century, for example, were dubbelt öl, or double ale, enkelt öl, or single ale, and svagöl, "weak ale". Beer Nerd Details: 9% ABV bottled (22 oz. bomber). Drank out of a goblet on 10/29/11. Bottled June 2011. Pretty Things (another of them newfangled "gypsy brewers") are now on the list of breweries where I'll need to seek out more of their stuff. And naturally, I want to get me some more of this particular beer as well. As for other Quads, I will say that it's among my favorite styles, so expect to see some more of them (or, at least, Belgian Strong Darks, which seem to be popular this time of year). I think I may even have a line on a bottle of the fabled Westy 12! Beer Nerd Details: 6.8% ABV bottled (750 ml capped). 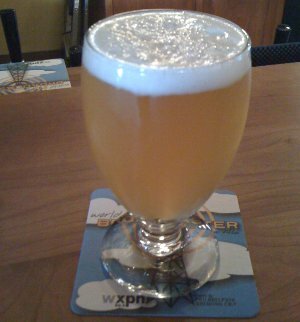 Drank out of a tulip glass on 10/22/11. Hops: Warrior, Cascade, Centennial, Amarillo, Simcoe. O.G. : 1.062. 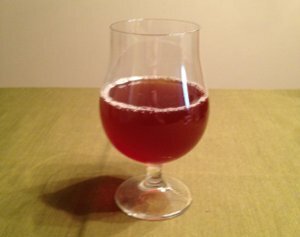 Dana's Homebrewed Dubbel - A nice dubbel style beer, only recently bottled, so it could probably use some more time to condition, but it's still pretty good. Nice traditional Belgian yeast character with a medium body. Easy to drink. We didn't get to try a few of the beers in the picture, including Troegenator, Hoptober, and Amish Four Grain Pale Ale. 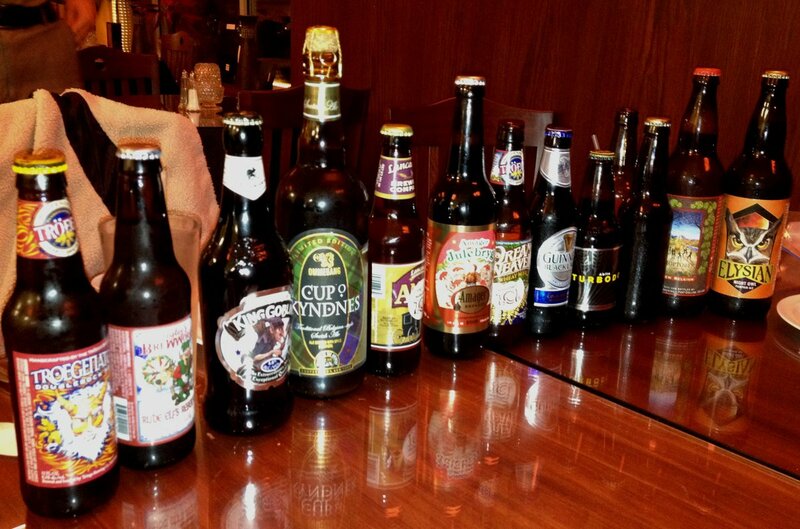 All in all, another successful outing for the beer club. I'm already looking forward to the next installment, as we will most likely be drinking all Holiday beers (aka, my favorite seasonals). Damnation. No relation. Heh. 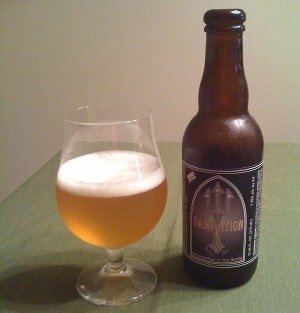 Seriously, though, this is the bigger sister beer to Russian River's Redemption (a light Belgian Pale "single" or "Patersbier"). Russian River is famous for their crazy barrel aging and sour beer experiments, but this is just a good old-fashioned Belgian Strong Pale Ale. Don't let that fool you, though, as this is one fantastic beer. 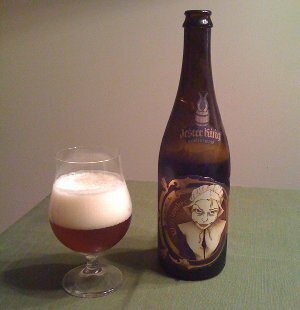 I've actually had it several times before, both in the bottle and on tap, and I've always loved it. Beer Nerd Details: 7.75% ABV bottled (375 ml mini-magnum, caged and corked). Drank out of a tulip glass. Batch #60, brewed 7/9/2010, bottled 8/5/2010, and drank on 10/1/11. I really wanted to start this beer earlier, but due to a variety of factors1, I didn't get to this until now. 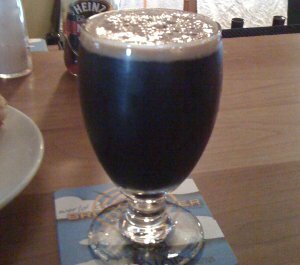 All I really knew is that I wanted a winter warmery type of beer, which is pretty damn vague. My local homebrew shop owner was very helpful, despite my lack of preparation here. We discussed a bit, talked about Anchor's Christmas Ale (which, granted, changes every year), and eventually settled on a dark red ale with my choice of spices added at the end of the boil. I'm actually pretty happy with the recipe - it sounds really good. Now to find out if it will taste good! Nothing super unusual here, though there are only two hop additions. The reason for this is that the aroma will be derived from spices rather than hops. Speaking of spices, I have no idea what I'm doing. Everything I've ever read about spices indicates that it's very easy to overdo things. So I'm deliberately attempting to keep it down2. Looking around at some other recipes, I see people adding about 0.5 oz. (or more) of spices to beers, which works out to 3 tsp. I'm trying to do less than that (though it's difficult to tell with cinnamon sticks/whole cloves, but I'm using slightly less than most recipes I've seen), which will hopefully leave me with some spicy goodness without overwhelming the beer. Not wanting to go in completely blind, I tried making a couple cups of spice tea (i.e. hot water and spice) using two different spice mixtures. I completely overdid the Nutmeg, which overpowered the other spices, so I cut that down in the recipe. But otherwise, it smelled pretty great. Of course, this doesn't even come close to approximating the final product I'm hoping for, but it seemed like a useful exercise. Alright, enough preamble, let's get this party started! Steeped the specialty grains in 150° F - 160° F water for around 20 minutes, drained, sparged with another half gallon of water, and put the lid on to bring the wort to a boil. Once there, added the 3 pounds of Amber DME, stirred like crazy for a while, brought it back to a boil and added the bittering hops. Here starts the clock. 30 minutes into the boil, added the rest of the DME and LME. This brought the boil to a standstill, so I took some extra time to get it back to boiling (which took 5-10 minutes). After another 10 minutes, I added the flavor hops. 5 more minutes, added the irish moss. With about 3 minutes left, I started adding the various spices, removing from heat just when I was finishing with the spices. Moved the pot to the ice bath to cool it off, brought it down to about 90° F, strained the wort (removing most of the spice and hops) into the fermenter, topped off with about 2.5 gallons of water, mixed it up real good, and took a sample and hydrometer reading. The wort was still about 75° F, so I had to wait a bit to get the temperature down (I moved it out of the kitchen, which was pretty hot at this point, and it cooled off after about 25 minutes so that it was in the high 60s). Not sure if the extra time sitting out in the open will be good for it, but it was definitely too hot to finish. I pitched the yeast, put the top on the bucket and installed the airlock. The temperature in my closet is in the mid 60s, which is perfect for this. Done. Original Gravity: 1.060. Assuming 75% attenuation, that should bring me down to 1.015 and about a 5.9% ABV. I'm actually hoping for slightly higher attenuation (and thus a dryer beer with slightly higher ABV), but either way, this should be pretty good. So I'm looking at two weeks in the fermenter, then bottling, and at least 2-3 weeks bottle conditioning. This will bring me to early/mid December, which is just in time for some Holiday celebration. Indeed, it should be peaking right around Christmas and New Years (though it may peak later). I don't think I overdid it with the spices. I could clearly smell them in the finished product, but it didn't seem overpowering. I guess we'll see what happens after the fermentation. My guess is that it will become even less potent after the yeast has its way with the wort. Worst case scenario, if the spices aren't coming through, I'll throw a cinnamon stick in the bottling bucket to give it some extra oomph. But from what people say about these kinds of spices, I should be fine. So there we have it. Not sure what's next. I've wanted to make a Belgian dubbel since I started (about a year ago), but winter is not the time for that. I should really make something that requires lower fermentation temperatures. I'm thinking perhaps an Simcoe single-hop IPA (or mixed hop IPA). 1 - And by variety of factors, I mean that I was lazy. Beer Nerd Details: 5.5% ABV on tap. Drank out of a goblet on 10/8/11.